So this is usually something that I'd never write a blog post about and I was most definitely in two minds whether to do so or not. 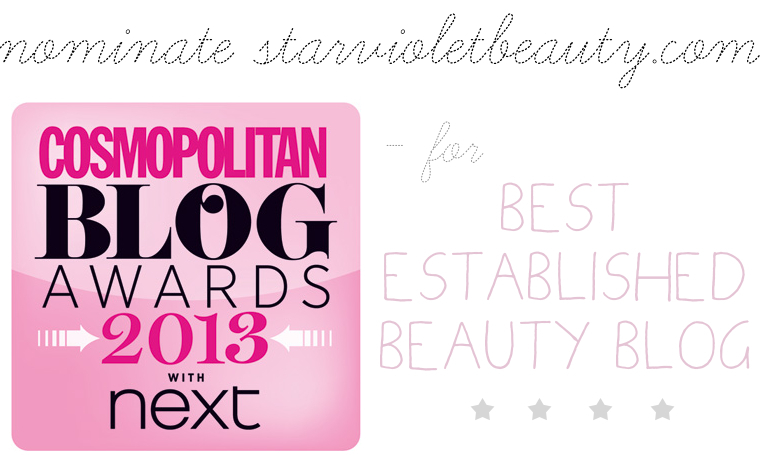 Cosmopolition are holding their yearly blog awards once again and are currently asking for nominations, which is where I need your help! I've seen these awards come and go for the past few years and unfortunately have never been lucky enough to get involved but this year I decided I'd try my best for some nominations. I love blogging and everything about it and never in my eyes does it feel like a chore or a job but it would be amazing to have some form of acknowledgement for all my hard work. I've never felt in the past that my blog was worthy of any kind of award until more recently that I've been posting pretty much every day and have spent much time researching what would be interesting to blog about, it aint easy being a full time blogger! Anyhow, if you enjoy catching up with my blog every now and then or never miss a post and read daily, please bear me in mind when nominating for the Cosmopolition blog award, just be sure to send me a tweet or leave a comment so that I can say a special thank you!